On October 14, 2011, in Shabwah province, Yemen, Abdul, went out with his cousins and friends for a good old US-style barbecue, when Obama’s drone fired a rocket, blowing the teenager to pieces. Or I should say “piece.” All that was left of Abdul was a piece of skull with long curly hair that allowed his relatives to identify this hunk of his head by his US-type haircut. Obama didn’t order the killings (Abdul’s friends and cousins died too) as a random act of crazy. No-Drama Obama doesn’t believe in random. Abdul’s problem was that his father was Anwar al-Awlaki. Obama killed Abdul’s dad as well. Daddy al-Awlaki, an American imam who voted for George Bush, had gone over to the side of the bad guys, and after leaving the USA, broadcast pro-terrorism radio reports from Arabia. We can argue until the cows come home about whether Daddy al-Awlaki was a legitimate kill target. It is, after all, right there in the US Constitution that the penalty for treason is death. I suppose that, before executing him, a jury trial would have been nice. But nice was not going to happen. So, OK, Barack, we’ll let that one go. But what about the 16-year-old? Obama didn’t even pretend that the kid was a terrorist, or terrorist in-the-making, nor adopting in any way his father’s crazed kill-Americans crusade. I guess he should have. But are you ready for this? The teenager””along with his cousin and friends””was killed two weeks after and hundreds of miles away from the site where rockets killed his father. I was straightened out on the facts by Richard Rowley, America’s most courageous investigative reporter. 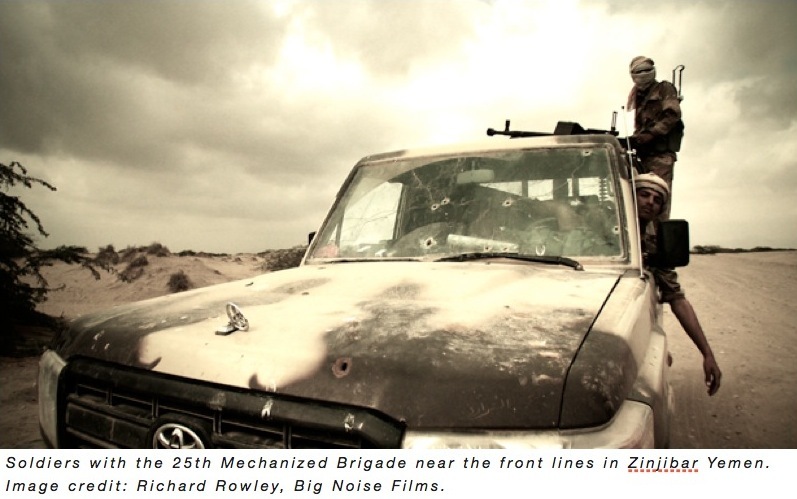 Rowley filmed, directed and edited the brilliant, horrific, and brilliantly horrific documentary Dirty Wars, previewing this week in the US. 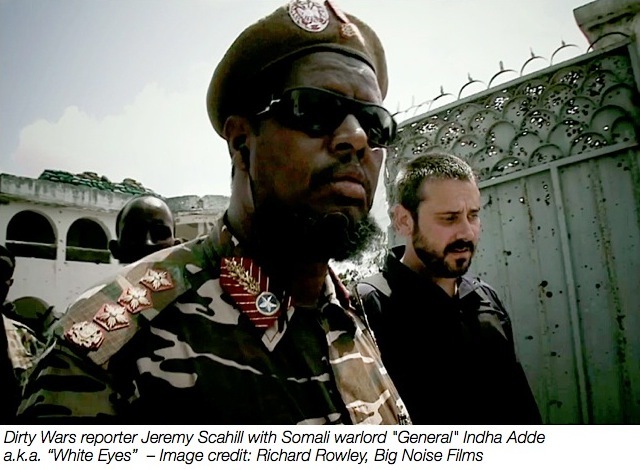 The film centers on Rowley’s reporting partner, the indefatigable Jeremy Scahill, whom Rowley follows from the scene of a massacre at a wedding party in Afghanistan to an interview with a warlord in Mogadishu (while under sniper fire). In Dirty Wars, Rowley and Scahill reveal that drones are just one toy in our Presidents’ murderous toy-chest. And the kill list is far larger than even a smart dude like Obama can tick off on a Tuesday. Scahill calculates that the targeted kills in Afghanistan and Pakistan now total more than 17,000! However, a courageous Yemeni reporter, Abdulelah Haider Shaye, visited the site, photographed the remains of the US missile””and was promptly jailed. The US is particularly shy about taking credit for the cruise missile kills as it boosted al Qaeda’s recruitment drive in Yemen. Rowley and Scahill are the only US reporters to have gone to the Bedouin village and filmed the missile casing””cold evidence confirming the US had entered a war without any legal declaration””-indeed, in complete secrecy. Scahill also revealed that, while Yemen’s President Saleh was nervous about keeping the reporter imprisoned, Saleh withdrew his pardon at the personal request of Barack Obama. 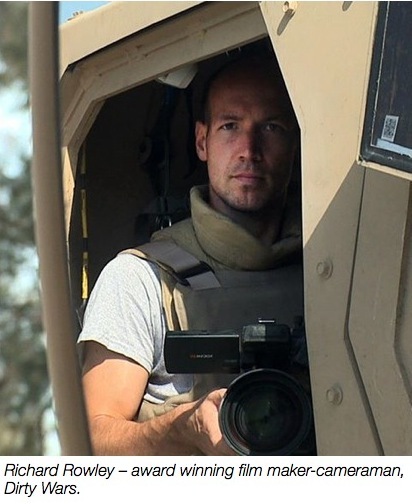 Obama wanted the journalist not just silenced, but punished. I was curious: Did Scahill and Rowley make use of Wiki-Leaks? “Wiki-Leaks was absolutely indispensible,” Rowley told me, a treasure trove of State Department confessions confirming what they found on the ground. It was through Wiki-Leaks that they discovered that President Saleh joked with US operatives about lying to his Congress about the US missile attack on al Majala. And it was in Wiki-Leaks that Scahill found the warlord Indha Adde””a.k.a. “White Eyes” was on the USA’s payroll. I should say, General White Eyes”“a rank he gave himself in the Somali Army by pinning three stars on his jacket. Where did the US military find this cutthroat? Previously, the Wiki-Leaks cables revealed, the US knew he was the protector of the al Qaeda bombers that blew up the US Embassy in Nairobi. Rowley captures the warlord/general on camera saying, “The USA is the master in war”””quite a compliment from a natural born killer like White Eyes. And General “Eyes” is quite right. The Drone Ranger’s secret war has now spread to 75 nations. It’s all under the command of General William H. McRaven. The US press is in love with McRaven, lauded as the man who planned the raid on Osama bin Laden’s compound. But there’s not one single US network or paper that would report on Scahill’s discovery that McRaven was also the guy who planned the night raid on the Afghan wedding party that killed the bride, the groom and the groom’s mother. Maybe that was some horrible mistake. But McRaven’s crew, called “The American Taliban” by Afghans, made sure that no one would finger the US: Rowley and Scahill obtained a secretly recorded video of McRaven’s commandoes slicing the bullets out of the bride’s and groom’s bodies to prevent their killers’ identification. McRaven’s semi-private army, the Joint Special Operations Command (JSOC), is warring in our name worldwide in nations he won’t name and Obama will arrest you for naming. Not even Orwell could have dreamed up that one. I asked about the value of Wiki-Leaks to Rowley and Scahill because of the ongoing trial of Pvt. Bradley Manning and the impending capture of Edward Snowden, the contractor willing to blow away his career and freedom to let you know that nice Mr. Obama has been spying on you. A rabbi from Nazareth once said, “The truth shall make you free.” And that’s exactly what Obama is afraid of: faced with the truths revealed in Dirty Wars, they know most Americans would cut themselves free of McRaven’s Seal Team Sick. I am convinced the hit on al-Awlaki’s son was meant to teach a lesson, If you want to be a martyr, we’ll make your son and your mom and daughter martyrs too. Such terror-for-terror can be, I’ll admit, quite effective. During the Ronald Reagan years, that gutless faux-cowboy President sent weapons to Ayatollah Khomeini in return for the release of hostages taken by Hezbollah. The Russians got their hostages home another way. The USSR didn’t accept an arms-for-hostage deal. Rather, the KGB systematically assassinated the hostage-takers’ cousins, mothers and brothers one by one””until Hezbollah released all the Russian hostages. By rocketing the children of those we fear, we are indeed teaching them a lesson. But what are they learning? Greg Palast’s films with Richard “Ricardo” Rowley for BBC Television and Democracy Now! are available on the DVD, Palast Investigates: From 8-Mile to the Amazon ”“ On the Trail of Financial Marauders. Locate screenings of Dirty Wars near you. Read Ricardo’s story in Palast’s highly acclaimed book Vultures’ Picnic. Greg Palast is also author of the New York Times bestsellers Billionaires & Ballot Bandits: How to Steal an Election in 9 Easy Steps, The Best Democracy Money Can Buy and Armed Madhouse.